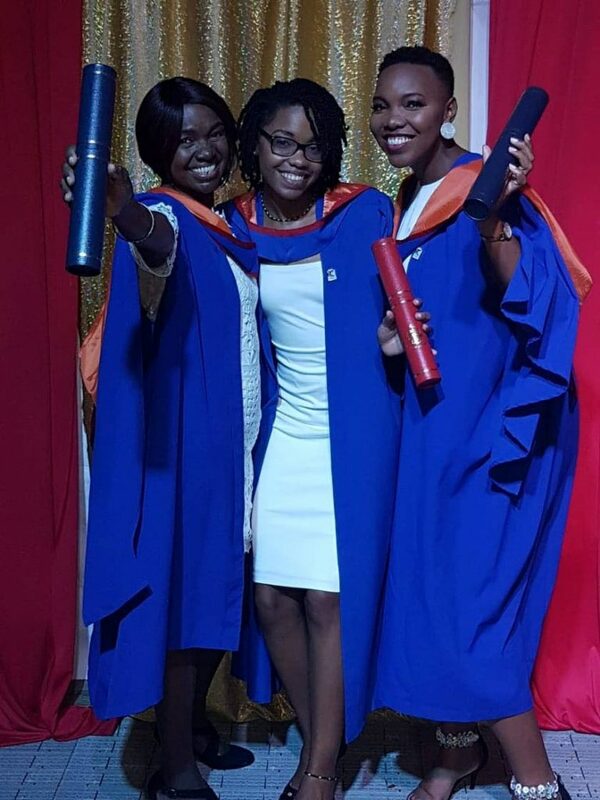 Judith Chase, left, with her daughters, Sonja and Siobhan Chase, right, at their October 2018 graduation from the University of the West Indies. All three graduated on the same day from the same faculty, Social Sciences. A graduation is a very special time in anyone’s life. Graduating with your loved ones makes that celebration even more special. 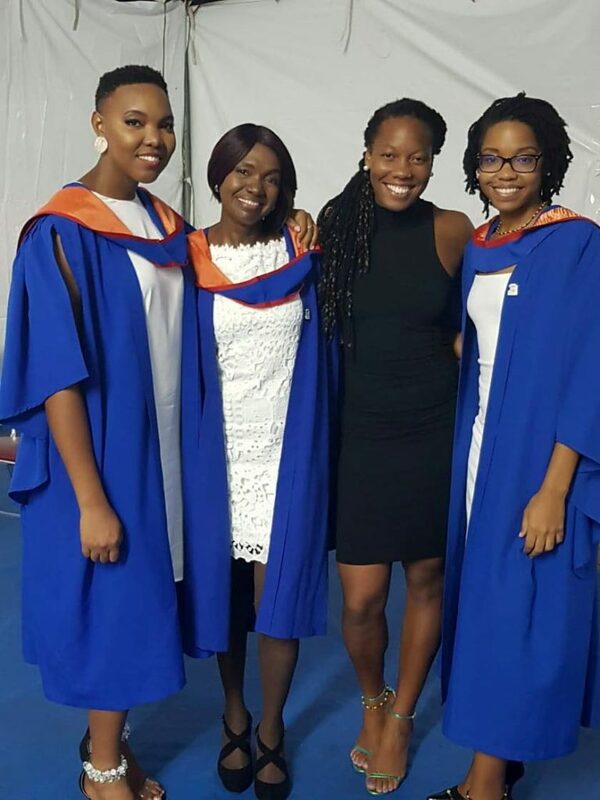 This was the case for Siobhan Chase, her mother, Judith, and her sister, Sonja , who all graduated from the University of the West Indies (UWI), last October. 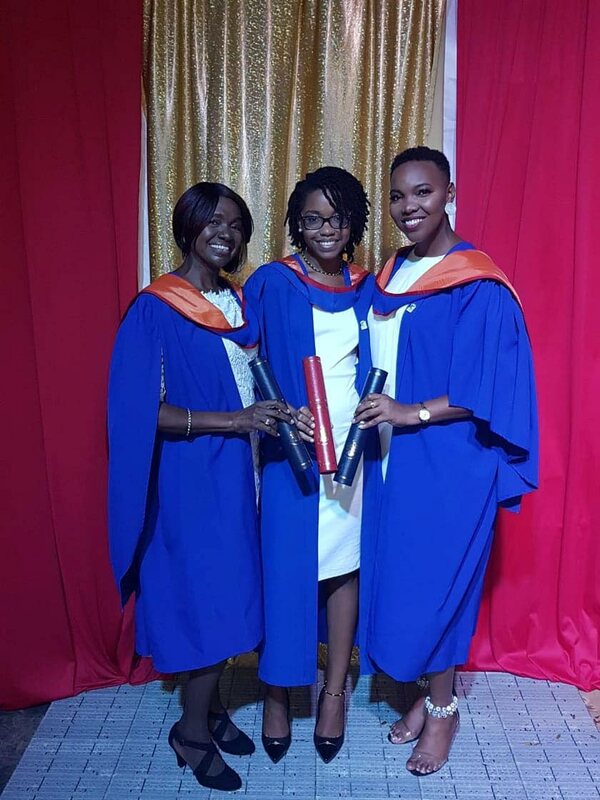 Judith graduated with a master's degree in public sector management, Siobhan also earned a master's but in criminology and criminal justice and Sonja has a bachelor's in international relations. Judith and her husband, Cameron, have a third daughter, Suraya, and the family live in Arouca. For Judith the educational push and drive began with her mother, Yvonne Bruce. While, at times, the process was gruelling, she remembered how her mother always spoke about the importance of an education. “At times, it would be a bit a frustrating, you feel as if 'I wonder if I can continue with this' but my mother, she died three days before her birthday last year, and she was a retired teacher so she always stressed education. “She always used to say that one thing people can’t take from you is your education,” Judith said. Every time she felt like giving up, her mother would say, "'What happen you talk to your supervisor. You get through with this?’"
Siobhan Chase, left, stands with mother, Judith Chase and sisters, Suraya and Sonja Chase. Her mother also had a degree and Judith, who works in the Public Service, felt she needed to attain the same level or surpass her. Although it happened late, because she did not have the money, she still got it done. Judith’s opportunity came through the Government Assistance for Tuition Expenses programme. Through this, she was able to study for her undergraduate degree in political science and then her master's. Her mother was able to see her degree before she died. “I was happy. I went and got my certificate before so that she saw it and held it. She was really, really happy and she was planning what she would wear to the graduation ceremony,” Judith said as she became emotional. Although they began at different times, life positioned them to complete their studies in the same year. The Chase graduands: The Chase family promotes education and it began with Judith Chase’s mother: Yvonne Bruce. Siobhan said graduating together was purely coincidental. “We only realised it would have happened that way, on the home stretch. “We all started at different points in time and our journeys were different as well. There was no way to foretell or foresee that this is what would have happened,” she said. Siobhan did her undergraduate degree in sociology, with a double minor in international relations and criminology, which she completed in 2009. Immediately after, she began her master's studies. However, her work then took her overseas and she took a leave of absence. “I had done the first year of the master's programme and then I applied for the leave of absence and was abroad for about a year and a half. Upon returning, I was unable to re-enrol immediately. It took a few years before I was able to do that,” she said. After she enrolled again, there were administrative hiccups with UWI which added additional time to her studies. There was even a period where she began having second thoughts about completing the degree. “I was thinking would it be worth it and all of that. I completed it because she (Judith) kind of made it a point to complete it,” Siobhan said. By that time as well, her youngest sister, Sonja, began her undergraduate degree. Sonja was scheduled to complete her degree in 2017 but had an additional course to do and so her graduation coincided with her mother's and sister's. Siobhan said "actively began writing the thesis,” when she realised they all could graduate together, and completed it in a few months. As graduates the Faculty of Social Sciences so their ceremonies were on the same day with Sonja’s in the morning and Judith’s and Siobhan’s in the afternoon. Judith felt a sense of “achievement, joy and pride” for not only graduating but also being able to do so with her daughters. She assured those thinking of a pursing a degree that it was worth the investment, adding the process teaches an individual discipline, maturity and time management. “(This) augurs well for you in anything you meet later on in your job or outside of it,” she said. Siobhan believes education is always worthwhile but did advise young people they had choices in what and how they learned. “That is what my mother had said to me. That is what her mother had said to her. 'After sixth form you’re going to UWI. Figure out what you want to do there but you’re doing something there.' There are so many more options and we don’t have to streamline ourselves," she said. Siobhan said her second sister, Suraya, for instance, was adamant about not pigeon-holing herself – Suraya wants to do certain things that weren't necessarily textbook and there were sacrifices she would have to make to fulfil those dreams. “And I applaud her for that. As the eldest I could not take that approach." Suraya has her degree and studied at sport and physical education at a university abroad. Also, Suraya and Sonja launched a musical group called Eko. They are composers and play the steelpan. “They have been musically inclined for most of their lives," Siobhan said, who is the group's manager. All of the sisters entered calypso competitions and were involved in Drama Making A Difference company (DMAD) which came out of St Augustine Senior Comprehensive where Suraya and Siobhan were in sixth form. “We dabbled as well in Best Village and there is theatre and the performing arts as a medium for expression,” Siobhan said. Siobhan said the sisters, based on their love for music, have written and composed songs and decided to record one this year. It was released on New Year’s Day and is called Keep Calm. People, she said, need to find personal reasons for why they are doing whatever they are doing. “People need to take time to discover themselves and their career,” Siobhan said. While Siobhan believes in personal fulfilment, Judith felt legacy was important. “Even if you don’t start out that way in education at some point someone would break the mould and carry on from there,” Judith said. Parents, she said, should support their children and be involved in whatever interested them. Reply to "Graduating with your mum"